TAIWAN FUN MAGAZINE, November 2007. A. 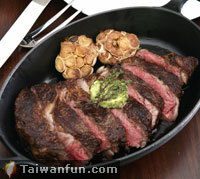 A Chef's recommendation, the USDA Prime Center Cut Rib Eye (22oz, NT$3,300) is tender and juicy, topped with sauteed garlic. The presentation is also pleasing to the eye. B. 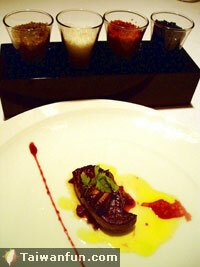 A Cut Steakhouse also offers a great selection of appetizers: Seared Foie Gras imported from Canada, braised with abalone (NT$700) is an excellent choice. Also available are the Arugula and Baby Greens Salad (NT$380) and Veal Consomme; both have great flavors.